In 2014 AVAC held Research & Reality, a year-long dialogue about prevention research and advocacy that took place via teleconference and webinar. We designed the series to provide information and debate about key topics. Some of these were clear priorities, while others emerged as data and country-level progress took us in new directions. For an idea of the issues we tracked in 2014, see our advocacy timeline (first appearing in Px Wire and available at the bottom of this page). Slides, audio and a Flash presentation of all webinars are available below. In this webinar, we used the collective wisdom of civil society partners working on relevant issues in their countries and communities to propose, explore and debate some of the areas where prevention research and implementation is well coordinated—and places where more union is needed. In Melbourne, UNAIDS launched a new initiative known as “90-90-90”, which lays out new targets for testing, treatment and virologic suppression. Where did these targets come from, what do they mean—and where does prevention fit in? Chris Collins, Chief of the Community Mobilization Division at UNAIDS addressed these questions and more. AIDS 2014 featured analyses of data on the potential relationship between hormonal contraceptives and risk of HIV infection. Researchers Charles Morrison (FHI 360) and Kristin Wall (Emory University), and Mary Lyn Gaffield from the WHO discussed the newest findings and guidance. Get details on the iPrEx OLE study from principal investigator Robert Grant, who presented the data at AIDS 2014. The first open-label PrEP study to publish results, these data from iPrEx OLE begin to answer a number of questions on PrEP use in the “real world”. AIDS 2014 brought more updates on voluntary medical male circumcision (VMMC) including new data on risk behaviors in circumcised men, the impact of cash transfers as part of VMMC programming and more. Kenyan researcher and implementer Kawango Agot reviewed the latest findings. State of the Art HIV Cure: Where are we now and where are we going? The field of cure research is evolving and expanding, with various proposed trials that require informed engagement from many stakeholders. Get an update, discuss research and hear questions answered by plenary speaker Jintanat Ananworanich. 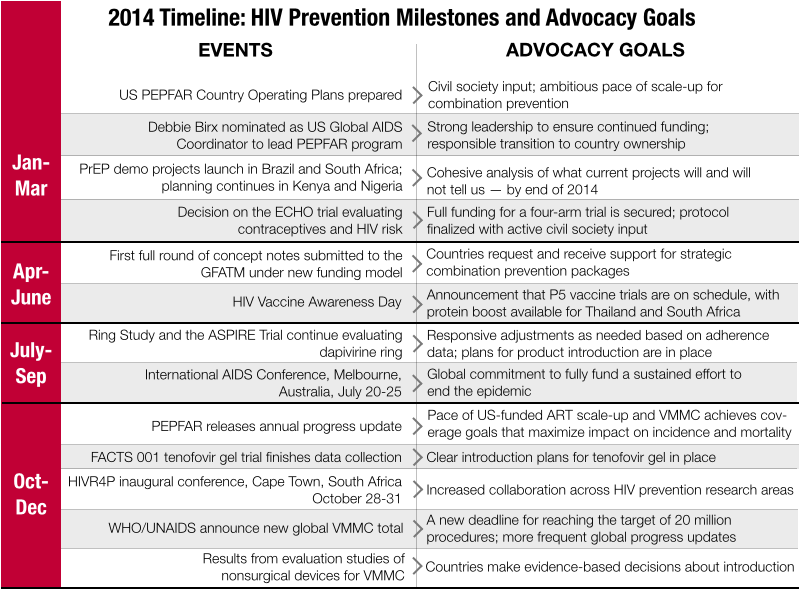 Kickoff Webinar: What to Expect in 2014—Where should prevention advocates put their energy?